Sabrina Howard and Ariella Gentin both attended high school in the Bronx, N.Y. at schools approximately five miles away from each other. It was not until they met at Brandeis that they had another surprising realization: Neither had ever sat in class through grade 12 with someone who looked like the other. Howard, who is Black, grew up in the Bronx, N.Y. and attended public schools, graduating from KAPPA (Knowledge and Power Preparatory Academy) International High School in 2015. Gentin, who is white, grew up in nearby New Rochelle, N.Y. and attended private Jewish day schools, graduating from SARS Academy (Salanter Akiba Riverdale) in 2016. 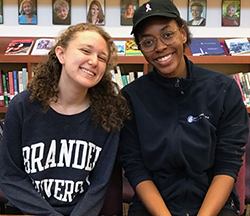 Both say their inexperience with the other led them to Brandeis Bridges, a campus group started six years ago with the mission of creating a space for Black and Jewish students to have dialogue and build connections. The centerpiece of the Brandeis Bridges experience is an annual trip that includes visits to Black and Jewish sites. This year, the group will visit Morocco in February. They chose it to get a sense of the culture and history, but also to get away from the paradigms of U.S. race relations. Last year, Gentin and Howard were part of a Bridges cohort that traveled to Chicago. There, they realized that experiencing each other’s culture and heritage could cause them to question their prior understandings. For example, Howard found herself completely unfamiliar with everything during a Shabbat dinner at a private home. She and the other Black students watched while the Jewish students seamlessly fit in even though they had also never met the hosts of the dinner. The situation flipped when the group attended a Baptist service at a Black church. “That was a comfortable space for me, like being home, like my childhood of going to church with my mom and sisters. It’s a different vibe from synagogue because we are up talking, singing. It’s a lively and animated experience and it was interesting to see how other people reacted,” Howard said. Gentin, Howard and the 10 Bridges fellows will be joined by Allyson Livingstone, Ph.D, Brandeis’s Director of Diversity, Equity, and Inclusion Education, Training, and Development and Alex Kaye, the Karl, Harry, and Helen Stoll Assistant Professor of Israel Studies from the Near East and Judaic Studies Department. Livingstone noted that the experience Gentin and Howard had in high school is not so far from some experiences at Brandeis. That’s why both Livingstone and Kaye welcome the opportunity to learn from each other and from the students as they all strive to reach the important goal “building the community they seek,” Livingstone said. Kaye joined because of his deep beliefs in the goals of the trip. “Today, perhaps more than ever, it is so important for us to be able to encounter and connect with people who may have different life experiences and ways of thinking. This process requires intellectual openness and emotional bravery. It is also exhilarating, edifying and fun,” Kaye said. As they approach the February departure date, the group is raising money for the trip. HBI is one of the financial supporters because “it is a wonderful example of inter-religious and inter-racial dialogue led by students at Brandeis. HBI’s mission to support innovative thinking about Jews and gender seeks to support these opportunities to build understanding and to affirm the leadership of young women,” said HBI Director Lisa Fishbayn Joffe. Gentin noted that ahead of the trip, this year’s student cohort of nine women and one man seems a bit more comfortable than last year’s, maybe because gender is less of an issue. Howard added, “We all have intersections of our identity and some are more visible and prominent than others.” Without gender being as much of an issue, they may be able to get comfortable more quickly and get to work on other identities, she said. Ideally, they would prefer more perspectives in the group and hope to bring that in the future, they said. Donors can support Brandeis Bridges by clicking here and specifying “Brandeis Bridges” in the text box. First, a well-written and inspiring article. But whenever stories are written about black-Jewish dialogue, what’s often missing is the perspectives of black Jews, and yes there are many people of color in the US who were either born Jewish or converted to Judaism. Their opinions are very important: given that most Jews in the US, and most leaders of Jewish organizations (including most rabbis) are white, it’s crucial for the Jewish community to be more welcoming to Jews of color; and it’s equally important to include them in efforts to improve communication between blacks and Jews (since they are a bridge to both identities). Morroco will be wonderful, but to be meaningful will have to touch on why so few Jews remain there, and complex relation of Morrican Jews to the country their families left as well as to and within Israel. I thought that you would be interested in this article seen you have a degree in black studies. Pleasant. But irritating with the sameness of its assumptions. It is definitely pleasant, as previously noted, that your group chose a place where many of the Jews are not white-complected. It would have made a much better impression on me, at any rate, had you ventured south of the Atlas, where many Jews are very brown or black. You wrote this article with the predictably disappointing All American Jews Are White Ashkenazim & All American Blacks Are Baptist (Or AME or AME Zion) point of view which is a substantial part of the problem with nearly all the reportage and conversation in this country. I have a suggestion. To add some layers to ongoing projects and writing, start digging up Black folk whose community definition is broader than the one you portray here — and get some of the younger ones invited & admitted to Brandeis — and also get Sfaradim who aren’t White. Those are not polarities I grew up with in the middle of Crown Heights and Midwood, nor the polarities of plenty of people I grew up with. And, as you try to add depth to your readers’ knowledge, deal with complexities of how Moroccan Jews, and others from the Maghreb, define themselves culturally (which means, if they end up in the US, Europe, or haAretz, how they see themselves racially). Not quite the complexity one can flesh out fully in an article in alum-oriented pubs, but ideas that can be referred to, as leaving them out reinforces some of the presuppositions that all our communities need to walk out of. Amy and colleagues, In the 1990s I taught courses on Black/Jewish (literary) Women’s Relations at the University of Frankfurt and would be happy to share syllabi, materials, book lists, papers, speeches, etc. I’m sad to note that, from the info in the (admittedly short) blog, much of this rich history seems unknown. I’d also like to mention one course I found particularly satisfying: “Black Jewish Women Writers and their Mothers” (who were also authors … yes, there were already enough to provide for a whole semester of mother/daughter/black/Jewish enjoyment).